When I crept into Everest Base Camp on 22 May and posted some messages to say I’d reached the summit and was safely back down again, I was overwhelmed at the response I received, from close friends, to people I’ve not spoken to in years, to people I had never met before who had been following my blog during the expedition. There were so many I couldn’t possibly reply to all of them, and not adequately in the exhausted state I found myself in. One thing bothered me though: nearly everyone asked the same question: “What’s next?”. It was a question I couldn’t answer. 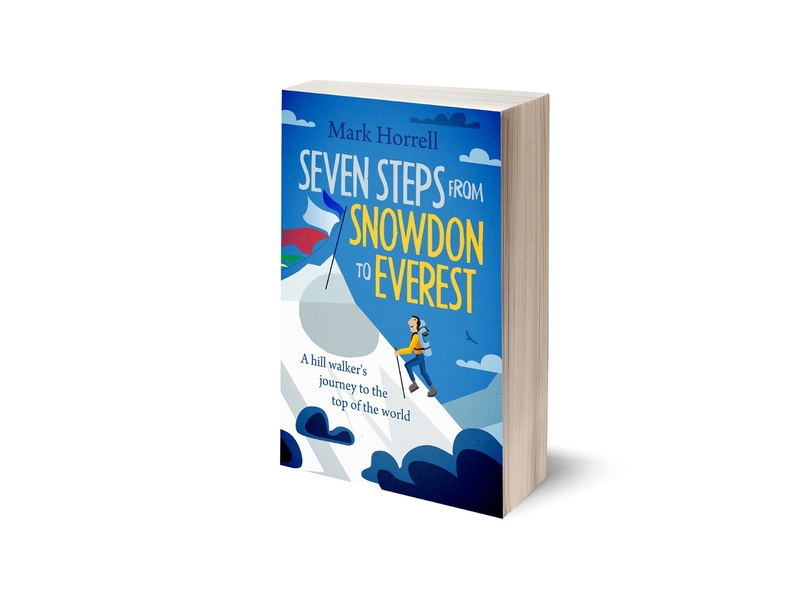 Everest was something I’ve been gradually working up to over a period of 10 years, climbing progressively higher and harder mountains. This time last year I was still chasing my first 8000 metre peak, which I finally achieved after several attempts in October by summiting Manaslu in Nepal. Everest came round very quickly after that, and I assumed I would need more than one attempt. I hadn’t really thought beyond it, though I knew I wouldn’t be retiring from mountaineering – I enjoy it too much for that. If I need another goal after Everest then I need to think long and hard about what it’s going to be. It certainly wasn’t something I could address at Base Camp in Tibet with a brain that felt like it had been pummelled by a Shaolin Monk. I had to answer the what’s next question with a reply which, while perfectly true, was a bit of a cop out and would have satisfied no one: “rest, recovery, and a beer in Kathmandu”. It wasn’t difficult to think of an interim answer that would satisfy everyone, though, although I’m afraid to say it’s not a very imaginative one. Some 400 people have completed the Seven Summits (the highest mountain on each continent) and after Everest (Asia) I’m already up to three, having climbed Kilimanjaro (Africa) in 2002 and Aconcagua (South America) in 2010. Back home and out of work it seemed a good time to slip another cheeky one in before I start job hunting again. So on Saturday I will head off to climb Elbrus in the Russian Caucasus, the highest mountain in Europe, whose name translates loosely and in a roundabout way from ancient Kurdish and Persian, as High Guardian. Twin summitted, its higher 5642m western summit was first climbed in 1874 by members of the Alpine Club, but there were very few further ascents until after the Communist Revolution of 1917. A hut was built at 4160m in a place which became know Priut 11 in 1929, and another hut was erected at 5350m in the saddle between the two summits in 1933. Work began on a cable car up the mountain in 1959, and by 1976 this went all the way to 3700m, where there’s now a café. 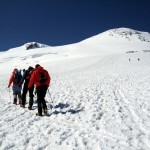 Nowadays a good summit day on Elbrus can see as may as 100 people climbing it. You will deduce from this that in terms of accessibility and technical difficulty it’s probably the most straightforward of the Seven Summits I have remaining (the others being Vinson in Antarctica, Denali in North America, and Carstensz Pyramid in Australasia). The cable car can be caught from the ski resort of Terskol on the mountain’s south side, and from the top it’s an easy 2 day glacier walk to the summit. It’s even possible to take a snow-cat to 4500m, and in 1997 the Russian climber Alex Abramov drove a Land Rover to the summit. 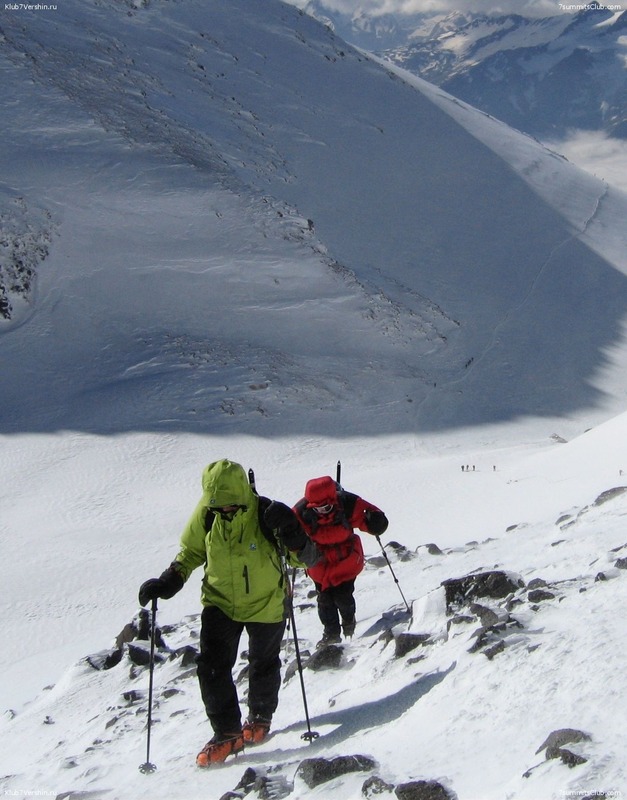 Recently the problem with Elbrus, for British climbers at least, has been political. It is situated in the Kabardino-Balkaria area of southern Russia, quite close to the border with the troubled Republic of Chechnya and for a long time the UK Foreign and Commonweath Office (FCO) has advised against going there. This means UK tour operators don’t run trips to Elbrus, and more importantly it means UK nationals have difficulty getting insurance. Happily the British Mountaineering Council (BMC), the insurance body of choice for UK climbers, has a policy which covers parts of the world where the FCO advises against “all but essential travel”. Presumably the BMC recognises that for Seven Summiteers expeditions to Elbrus are essential travel! They run a trip with a slightly more interesting itinerary which involves a full traverse of the mountain, starting on the main tourist route from the south, but descending the quieter northern side. They run a broader range of expeditions across the world than Pilgrim Tours. As their name implies they run expeditions to all of the Seven Summits, but more intriguingly for me, they also go to the Snow Leopard peaks in the Central Asian republics of Kyrgyzstan and Tajikistan (the five mountains over 7000 metres in the former Soviet Union). Few mountaineering companies cover these peaks, and if I like 7 Summits Club on Elbrus then I would be interested in climbing some of these other mountains as well. I have a certain affectionate loyalty to 7 Summits Club. On Everest this year their owner Alex Abramov (the very same man who drove a Land Rover up Elbrus) threw a big party, inviting everyone at Base Camp, and providing liberal quantities of food and drink for all of us. At the time I assumed they were a Russian speaking only operator, but at the party I discovered they had English speaking clients and guides, one of whom I later met at Sam’s Bar in Kathmandu, and he spoke very highly of them. So you could say I booked the trip with 7 Summits Club because they gave me free beer. It seems as good a reason as any. 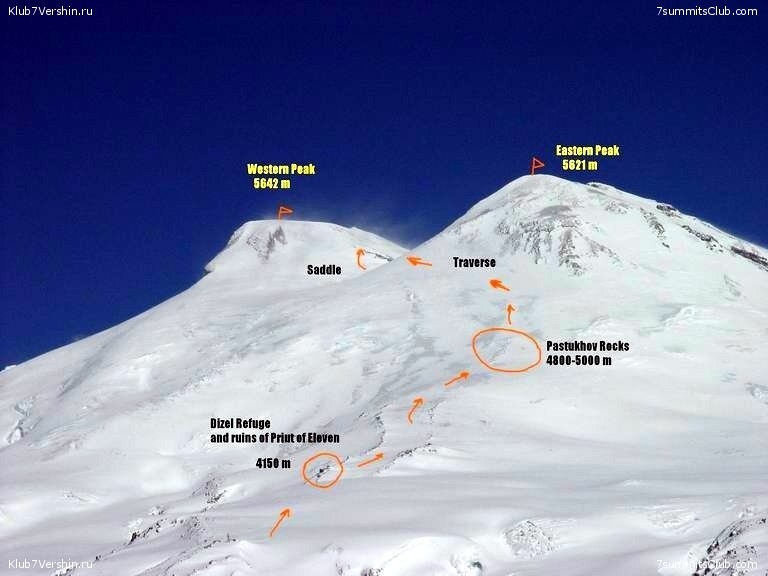 So with cable cars, snow-cats and easy glaciers to climb, Elbrus shouldn’t present a problem, although the weather is always a consideration on any big mountain. I have a feeling my biggest enemy is going to be the altitude. 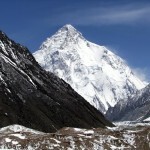 I’m due to be climbing to the summit just five days after my arrival. This is the fastest I’ve ever ascended to that altitude on any mountain without prior acclimatisation, and I expect to experience headaches and find it harder work as a result. Although the speed of ascent means there’s a small risk altitude may prevent me from summiting, I’m generally a good acclimatiser and I find if you’ve been to high altitude recently then you acclimatise much more quickly. That I was at 8848m little more than two months ago should stand me in good stead. 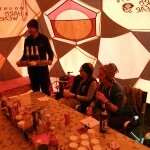 I’ll finish with some footage of the 7 Summits Club team in action – they certainly know how to party. Cheers, John. FCO always err on the side of caution, and their advice tends to make places seem far more dangerous than they are. There are times in the past their advice for Nepal sounded horrendous, but I always ignored it and loved the place. 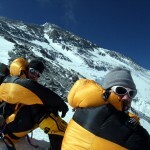 Sorry to hear about Cho Oyu/Manaslu. It must be very disappointing, although exactly the same thing happened to me in 2008, when uncertainites over permits caused my expedition to be switched from Cho Oyu to Manaslu, and like you I decided to wait another year for my first 8000er. I don’t expect the Tibet ban to remain for very long, and hopefully next year Cho will be fine. In any case, you get up these mountains eventually if you keep trying! The Nubra region is lovely. Very quiet; the peaks are quite straighforward mainly, and there’s some beautiful trekking too, unlike on Cho. I love Leh as well – it’s like a quieter, more chilled version of Kathmandu but with the mountains much closer. I’m sure you’ll have a great trip. Mark, I might be at Elbrus myself this year in September. Failed there in 2010, but it’s a beautiful place, and I wish you the best of success. Enjoy. Cheers, Charles, hopefully you’ll get to do it. Did you have weather issues?